﻿ Ekmeleddin İhsanoğlu's Marketing Strategy Why is it Wrong? Ekmeleddin İhsanoğlu's Marketing Strategy Why is it Wrong? We have seen three or five times what the candidates have done in the election strategies and what they plan to do, with little time left in the presidential elections. Let's compare the election strategies of the presidential candidates. First, we have examined Ekmeleddin İhsanoğlu's strategy in general. Ekmeleddin Ihsanoglu's slogan is built on the language of communication is a language, both video and texts used in the understand. The slogan "for bread" has been chosen in a way that it is similar to its name and expresses two different meanings. On the other hand, the slogans of lovers, lovers, unity, dignity, respectful bread are a bit distressing to me. 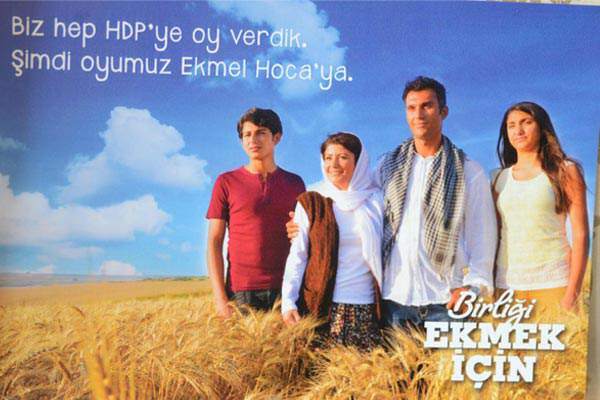 Only the HDP Union, only the AK Party for the Bread of Diriyet mean at the same time, there were understandable slogans. In other words, those who voted for the MHP do not really care about the Union and the result can be removed. However, the message to be given can still be understood by everyone. The slogan "for bread" has become a slogan criticized by many. This slogan, which is regarded as a slogan from the '70s, is a bit weak, saying that when the competitor candidate combined with the wheat fields, he produced his own plane, our satellite, I promised you bread. Especially the use of wheat field is a strategy for a little more rural. However overlooked that more than 10 million people living in the countryside in Turkey's no need to. That is to say that it is a bit of an effort to ask people who have not seen wheat fields and have established a bond with wheat fields and people who have not traveled in it. Ihsanoglu's logo was again a criticized and disputed item, like the slogan, in the communication language. Although it seems to be out of the word art, I do not find the use of the logo very wrong. Yes it could have been better, but a logo memorizing the person was made. One of the biggest handicaps of İhsanoğlu was difficulty pronouncing his name. After Logon, the name was slightly more memorized. When you look at the commercials on YouTube, many mistakes hit you. Election Song There are many technical mistakes in the videos, such as no sizing, slides not synchronized with the lyrics. But I would not be able to connect the words of the election song if the technical mistake would leave an edge. When this separation should be finished, should the separation with whom should end? When we looked at the main commercial, it made me feel uncomfortable why there was a crowd in the field that walked and did not know how to paddle. I think the script of Filminin has been brought in a little hurry and wanted to play a little too much for the slogan "for bread". Especially in holiday places it is very difficult for outdoor activities to be done for a selection exercise. However the idea of ​​roaming the whole of the yachts with this yacht went my very liking. It's really a successful business. However, when we look at the overall outdoor strategy, we see that only 4 main banners in the field are placed on Billboards. In addition to her photo with a baby in her lap, there are 4 other ads written by the slogan. Apart from billboard advertisements, I have not seen much variety in Istanbul, such as stop advertising, racket, megalight and megaboard. But in my banner and posters, I think my nationality loves so much that, as in every election, in this election, all the candidates are headed for the biggest number of posters. Ekmeleddin Ihsanoglu is using Twitter in an active manner. The first thing that attracts attention is that Twitter uses @profdrihsanoglu username and ekmelihsanoglu username on Facebook. There are two different reasons why you do not have the same username. The first reason is that they have forgotten to get their username. If that's the case, it's really funny. The second possibility is that the Facebook and Twitter user groups have different value judgments from each other and their usernames are chosen according to these judgments. While Twitter users place more emphasis on the title of Professor Doctor, Facebook users seem to be thought to be more embracing the short and memorable "Ekmel" name. The language used by Ekmeleddin İhsanoğlu on Twitter is personal and official. Interaction with other users is not allowed. As a typical mistakes made by politicians in Turkey are being literal language of communication and social media overlooked the opportunities that it provides. Ekmeleddin Ihsanoglu's retweeting of the opposition and other candidates' messages on the Feast of Ramadan should also be noted as a very sincere and confident movement. At the same time, Ihsanoglu is the only candidate using Vine. On Facebook, Ekmeleddin İhsanoğlu page continues to be one-way communication, though the comments are not answered even though it is only a filter. For bread Ekmeleddin and Füsun İhsanoğlu also share content with different content through the strategy in the same direction. However, we can say that the design of the Ekmeleddin page for Bread is a little more amateurish. In the Instagram account, the images prepared for Facebook are shared against the spirit of Instagram. However, the filtered squares specifically shot for Instagram could be much more interesting. I think those who have made adjustments to the Youtube account did not manage their Youtube account before. Otherwise they would not link in this way. Some videos that appeal to video titles have changed as Ekmel teacher in some videos, and a unity has not been achieved. The contact is not in the language. When the website of Ekmeleddin İhsanoğlu is examined, the flat design draws attention. Although the use of color is not wonderful, it is my pleasure that the selection program is being given through Line.do. Although embroidered in terms of design and usability, embedding the election program shows that you have a digital seal. However, I would not want to see a name like "Sito Sercan" under the name of Similar Ingredients on the site of a presidential candidate. Ihsanoglu team on the domain suffered quite a bit. ekmeleddinihsanoglu.com was run by a completely different person, the guy broke the money with AdWords. com address is still not taken. ekmekicin.com and so on. Some of the domains are taken, some are not. In such cases, they are sent to the main site, which is similar to a name, in one or two letters, in different domains. For example, if you have one that is missing on Facebook then you will be redirected to Facebook. Especially for Ekmeleddin İhsanoğlu who is a difficult to pronounce name. Işsanoğlu's web site, social sharing icons, posture style was a little inspired by Tayyip Erdogan's site. I was particularly impressed with the layout of the Vine's on the main page footer. The site hosted in Costa Rica does not even have basic SEO settings, favicon, canonical URL, heading tags, etc. get the right. As far as I know, no work will be done on the name of Ihsanoglu after the selection and this website will not be used again. Another difficulty on the site is the Turkish character string. Turkish characters can not be used in titles in the menu. Obviously, I was not very happy with the selection guide being pulled from Google Drive. There has never been a choice to address both usability and usability. As a result, these guides will try to support the campaign by downloading a lot of unknown people who know how to use computers from all over the country. Ihsanoglu's website has also been protected by Cloudflare against possible DDoS attacks. It is a big plus that it has been considered beforehand. I saw another site called ekmel.tv when I was browsing the site, it is still official site. The live broadcasts are concluded with Livestream through this agreement. Unfortunately, this is one of the worst sites I've ever seen in my life. Although Ekmeleddin Ihsanoglu's general election strategy integrates well or badly with the communication language, there are missing aspects in a 360-degree strategy. A mobile application, digital applications, microcells, mailing, etc. the arguments are either incomplete or never used. Ihsanoglu's strategy is particularly troubling to transfer the discourse. It is difficult to say exactly when Ekmeleddin Ihsanoglu arrives.